May 20, Los Angeles, California, together with over 100 survivors of the Holocaust, victims of drug and addictions, friends, supporters, the Council General representatives of the Embassies of Israel, the Czech Republic, representatives of the Los Angeles Museum of the Holocaust and Spielberg's Shoah Foundation, we re-dedicated the Beit Tshuvah Czech Holocaust Torah. Being the keynote address, I was privileged to speak on the meaning of their Torah and life. "My parents were Holocaust survivors. My mother was from the Polish city of Lodz. My father was from Vienna Austria. My mother was liberated from the Bergen Belsen Concentration camp in Germany, April, 1945. Two days after liberation by the British she sat cradling her mother as she died of typhus. She watched as she was buried in a mass grave. My mother taught me many things. One important lesson she taught me was about survival when faced with absolute evil and death. She said those who tried to make it through the death camps without a friend, a buddy, usually died. With a friend, if you fell, they picked you up. If they fell, you picked them up. On the final leg of a death march from Auschwitz to the Buchenwald concentration in Germany, over a 1,000 men were herded out as cattle. Only a few hundred arrived alive. Along the way my father had collapsed from exhaustion. A Nazi soldier did not want to waste a bullet on him. He was bayoneted and left for dead. Somebody picked my father up. He would not leave him to die. I don't know who it was but my father was carried into Buchenwald. He was carried back into life. While serving in the Israeli army one of the first things that I was taught was that we do not leave anyone behind. I was injured on night. I still remember the hand that grabbed my belt and yanked me up. Who it was, I do not know. I was not going to be left behind. Together you had a chance to live, not a guarantee, but a chance. Facing the horrors alone was almost always the end. Jews have a dark secret they prefer not to speak about. Jews too can fall down by the road because of drugs, addictions and terrible personal choices. Addicts can be surrounded by other addicts. They can be still very much alone. Just six weeks ago, I did not know about Beit Tshuvah. Today, I do. 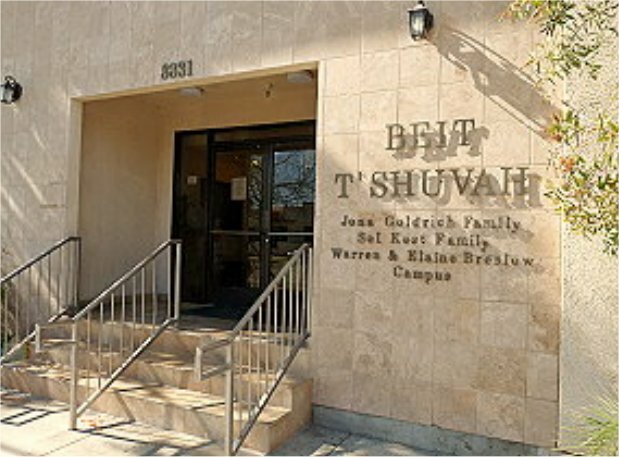 Beit Tshuvah is a not- for-profit Jewish drug and addiction rehabilitation facility on Venice Blvd. in Los Angeles. Six weeks ago, I did not know of their work to bring back, to return, victims of drugs and addictions from death to life. Leaving a person alone, Jewish or not, who has fallen, is not an option for them. I did not know that Rabbi Mark Borowitz is the spiritual leader of Beit Tshuvah. Until I read his book, I did not know that the Rabbi knows what addiction means  he is a former addict and a convicted felon. I learned his wife is the founder of Beit Tshuvah, a social worker by profession an incredible leader of "valor" and redeemer of humanity, Harriet Rossetto. Together they lead their family, the members of the "Shuv" through a twelve step cognitive behavioral therapeutic approach to recovery and independence heavily flavored with Torah based teaching and values. Jewish religious values are their guides. Jewish traditions, cultural associations and God is very much present. No one is ever imposed upon, to believe, to accept or practice Judaism. Rather, Judaism is a path that comes from Torah. The moral lessons of light, love and life at Beit Tshuvah that the Torah means to all of God's creations is present daily in song and spiritual healing to anyone of any faith background who wishes to find the link to something more than their aloneness. I learned that Beit Tshuvah is modest in style and appearance. Accommodations are very basic and frequently tight because of the need of the many who need. It is not a luxury revolving door "hospital" for the wealthy to check in and out. Each new member of the community slowly climbs the ladder of privileges until they are dependence free and once again free to be independent. Six weeks ago, I had come to Beit Tshuvah to photo-document a Czech Holocaust Torah that had been part of Beit Tshuvah's life for twenty years. During World War II, members of the Prague Jewish community wanted to preserve their Holy Torahs for the communities where they were from. They believed that after the War, the returning Jews would reclaim their property and rebuild their lives. For awhile the effort to preserve the Torahs worked in the Nazis interest. They used the Jews to collect, catalogue and preserve the Jewish treasures for their own purposes. Some said it was to establish a museum of the dead Jewish race but there has never been any evidence that the Nazis cared to preserve Jewish memory or culture. The archival work preserved the lives of the Torah curators for awhile. When the work was completed, the Nazis sent them to Auschwitz to be gassed and their bodies burned. 83% of Czechoslovakian Jewry was exterminated. The communities did not return to reclaim their Torahs. The Torahs languished alone, forgotten and molding for years after the War, no one to care for them, no one lifted them up to life anew. The Torahs moldered, and slowly died until a London based Jewish art merchant discovered them outside of Prague. Complicated negotiations ensued and for the right price, $40,000, the Communist Czech government agreed to release 1,564 Torahs for export to London. Within a matter of days, the Torahs were loaded on trucks and arrived in London's Westminster Synagogue to tears, terrible heartache and joy. The Czech Memorial Scroll Trust was created to place the Torahs in Jewish communities again. From its Westminster Synagogue location, some Torahs were made Kosher, many could not. A little gold colored plaque, at the base of the right hand side of the wooden handle plate on one, reads  Westminster Synagogue, Czech Memorial Scroll Trust #773. Torah #773 was not just a number. It has a story. It was written about 1850. It was probably part of the Torahs of the Kralovske Vinohrady Synagogue community in Prague. During the war, The Torah was first stored in a collection center at Strasnice-Praha or possibly at the cemetery hall of the nearby Olsany Jewish cemetery. The Torahs were removed by archivists in 1942. The synagogue was destroyed in an air raid in 1945. The people of the Kralovske Vinohrady Synagogue community, few if any survived, never returned. For 90 years the Kraslovske Torah brought light, love and life to its community. It was held, adorned with fine coverings and silver ornaments. It was lovingly carried and danced with in joy at festive occasions. The words read from its parchments gave life to the people. Then the darkness of evil, hate, bigotry and death came. The Torah survived the Holocaust, the people did not. 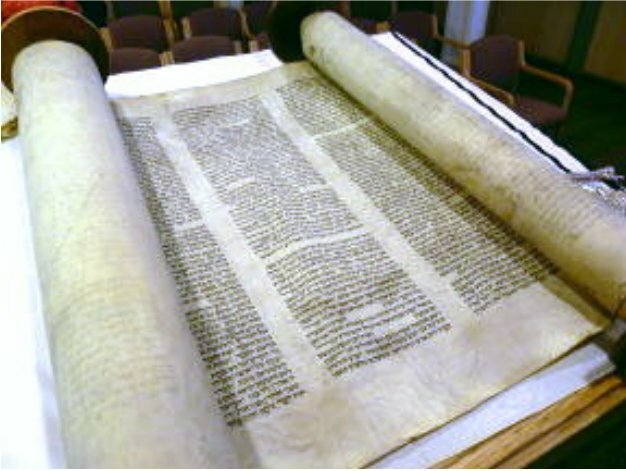 In 1992, a Torah was requested by Beit Tshuvah. Torah #773 traveled to LA were it was lovingly placed into the Holy Ark of Beit Tshuvah's community. It once again radiated light, love and life back to people who had, like the Torah, encountered an evil that sought their death. Together, the Beit Tshuvah Torah on permanent long term loan to the community lives, as it together with the people, return to the living. The Torah has returned. The community members of the Shuv have returned and are returning. I thank you for the privilege of permitting me to be a small part of you and to join with you in the dedication of your Torah. From life to life to life together."